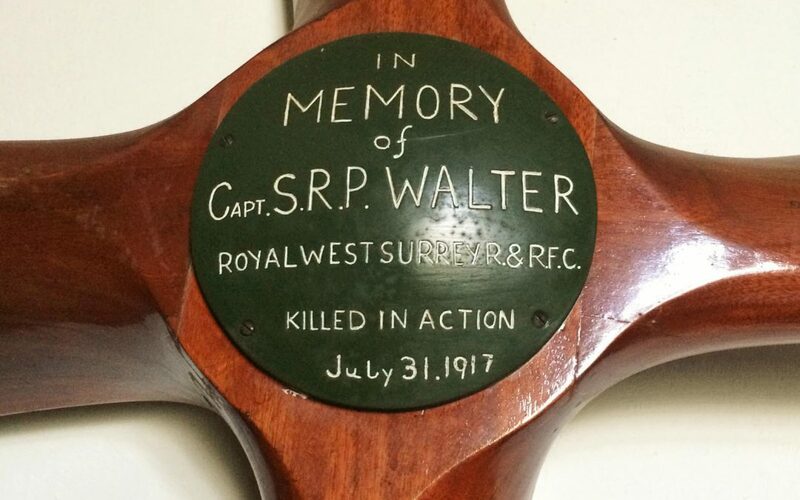 ROYAL WEST SURREY R. & RF.C. Text type (e.g. hand-written, GRU tags, carved): Difficult to be 100% certain. 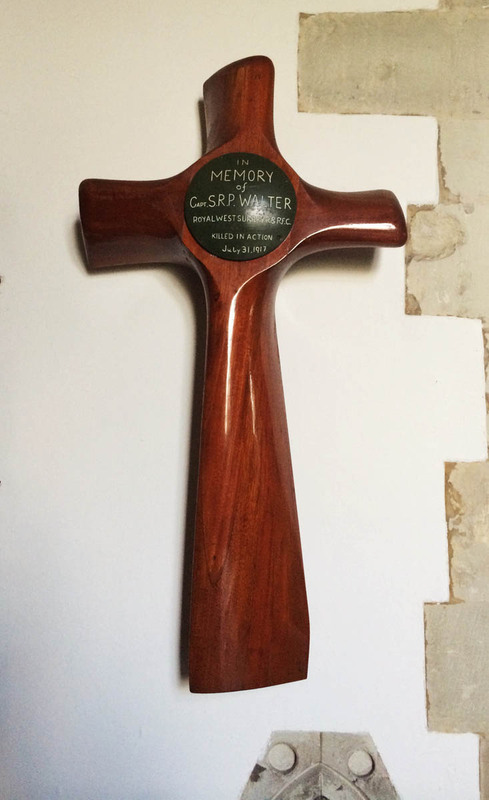 Cross is a cut-down four bladed aircraft propeller with a grey-green slate coloured (metal? bronze?) plaque (approx. 216mm in diameter) screwed onto it with four flat-headed screws, to cover the centre boss of the prop. 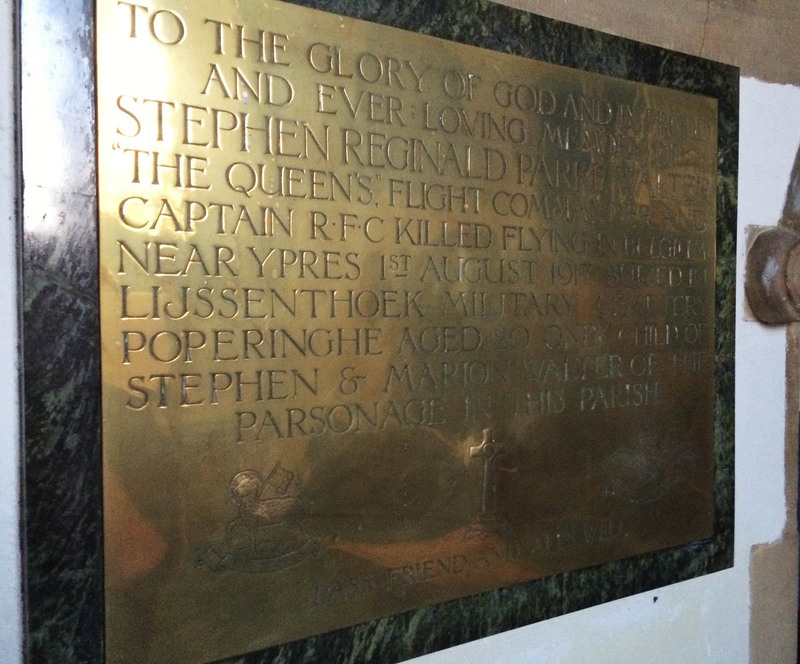 Commemorative wording appears to be cast into the plaque and is picked out in white paint. Finish (varnish, paint, oiled, unfinished etc): Appears to have been varnished. May have been oiled. Either way, the finish is highly polished. Condition (cracked, paint peeling, woodwork, damage etc): Very good. No visible damage. 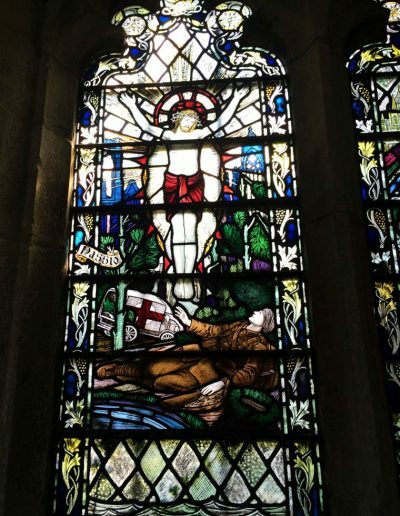 The cross is suspended on the wall of the church chancel, approx. 7ft up, to the right of the altar. In a recess below it is a laminated colour photograph of Lt Walter’s Commonwealth War Graves headstone in Lijssenthoek Military Cemetery, Belgium (Ref: XIV A 15). 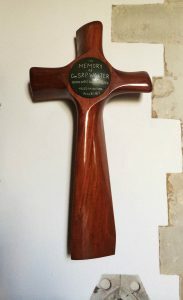 Below and to the right of the cross is an engraved brass plaque measuring approx. 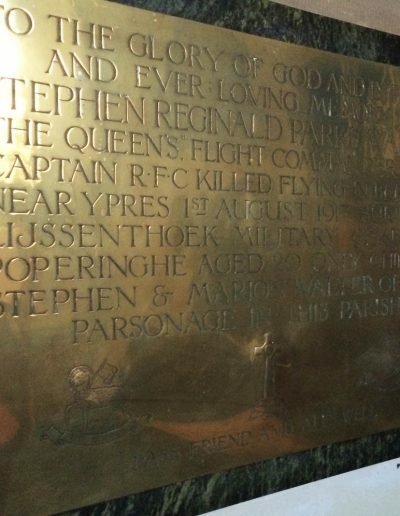 635mm by 495mm mounted on a polished dark granite backing, bearing these words: To the Glory of God and in Proud and Ever Loving Memory of Stephen Reginald Parke Walter “The Queen’s” Flight Commander and Captain RFC Killed Flying in Belgium Near Ypres 1st August 1917 Buried in Lijssenthoek Military Cemetery Poperinghe Aged 20 Only Child of Stephen & Marion Walter of the Parsonage in this Parish. 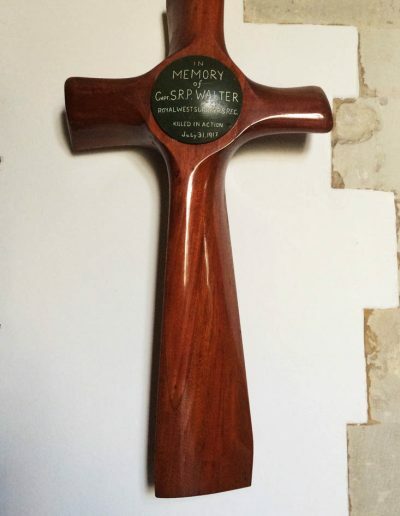 Beneath this are representations of (from left-to-right) the Queen’s Royal West Surrey Regiment cap badge, the propeller cross grave marker itself and the Royal Flying Cross badge. The final line of the plaque’s text then states: Pass Friend All’s Well. 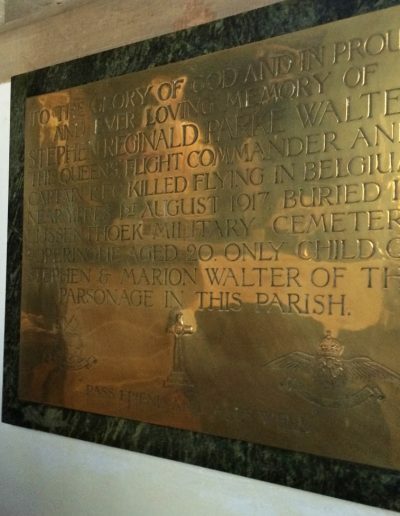 (Lt Walter’s parents also paid to have this engraved at the base of his CWGC headstone). 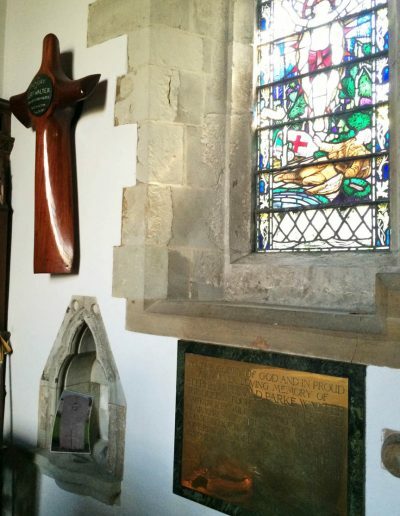 Immediately above the plaque is a pair of commemorative stained glass windows, understood to additionally comprise part of the memorial to Lt Walter. 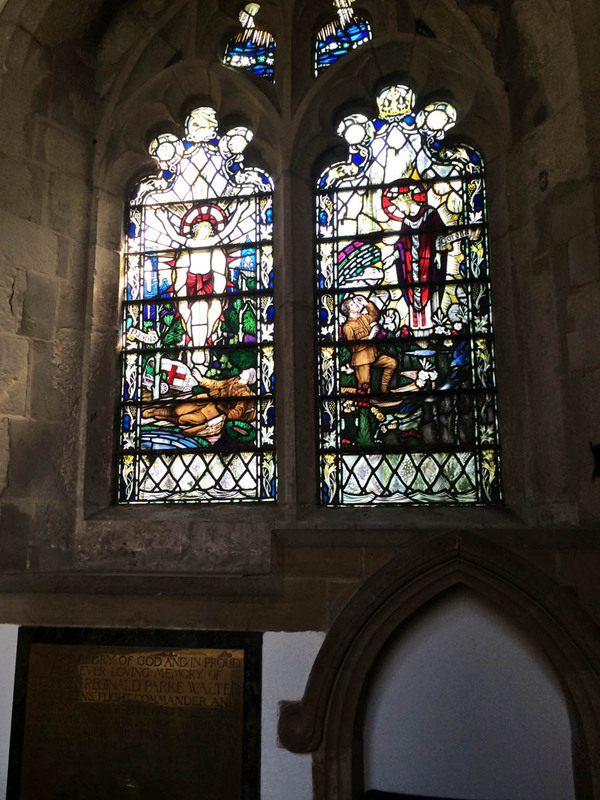 The left hand window portrays the scene of a wounded soldier in khaki, lying with his rifle at his side and with his head bandaged. In the left distance a motor ambulance is driving away down a muddied track. 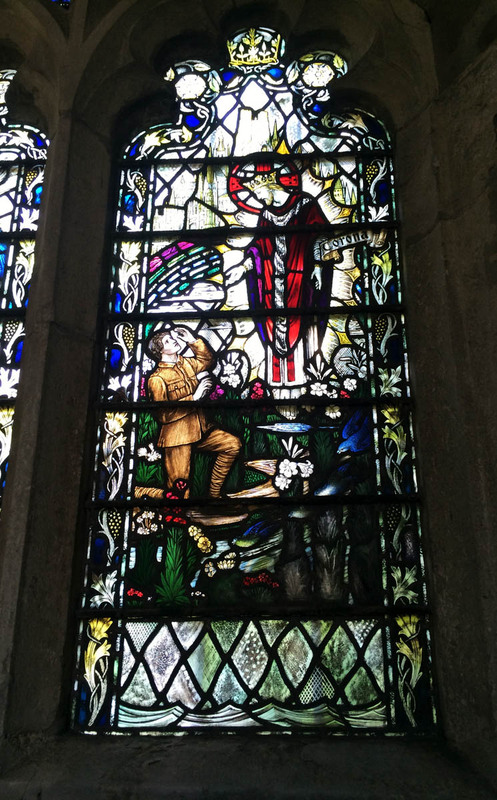 The soldier gazes up at a figure of Christ, to the left of which appears the legend ‘Passio’ (suffering). 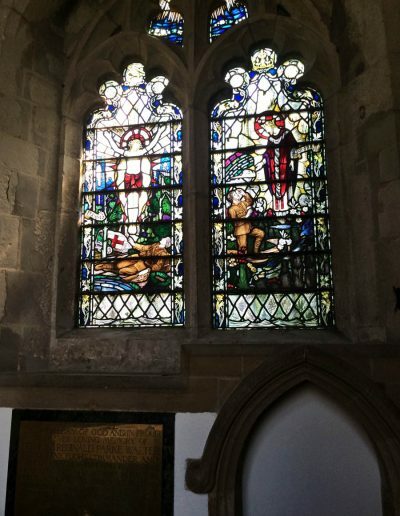 The right hand window portrays a similar scene. 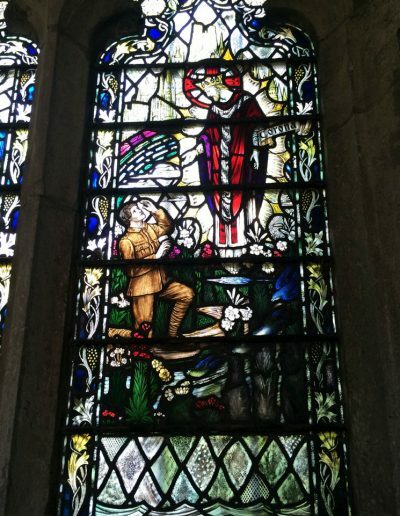 In this a khaki-clad soldier, with a seemingly saintly face, kneels and looks up to a crowned and robed Christ, reaching out a hand towards him. To the right appears the legend ‘Corona’ (crown). 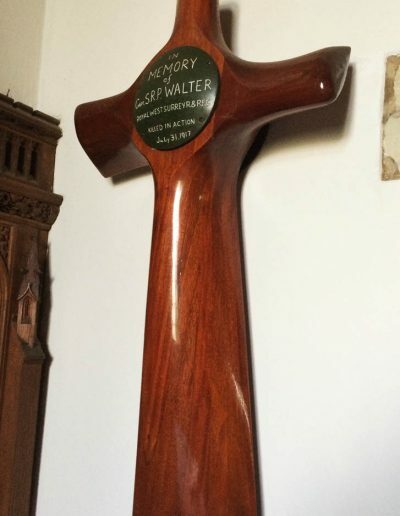 The church guide book notes that the cut-down propeller was indeed used as Lt Walter’s grave marker until it could be replaced with a CWGC headstone. Lt Walter was an ‘ace’ within a fortnight, recording five and one third ‘kills’ between 11th and 28th July 1917, flying with 32 Squadron Royal Flying Corps – having previously served in the Army (2nd Battalion Queen’s Royal West Surrey Regiment) and (on joining the RFC) 25 Squadron. Apparently with an illustrious flying career ahead of him, three days after his final victory Lt Walter was dead; killed when his aircraft – a DH5 – struck the cable of a balloon and crashed, on the opening day of the Battle of Passchendaele (Third Ypres). 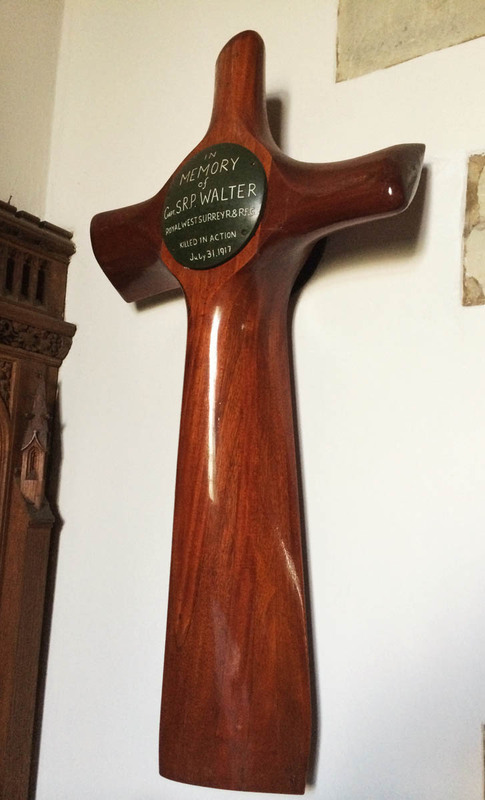 The propeller in the church cannot be from Lt Walter’s own aircraft as the DH5 had a two-bladed prop. It is possible that it is the propeller of an SE5 aircraft – 32 Squadron re-equipped with the SE5 towards the end of 1917, as the DH5 had been rapidly outclassed by other aircraft types. 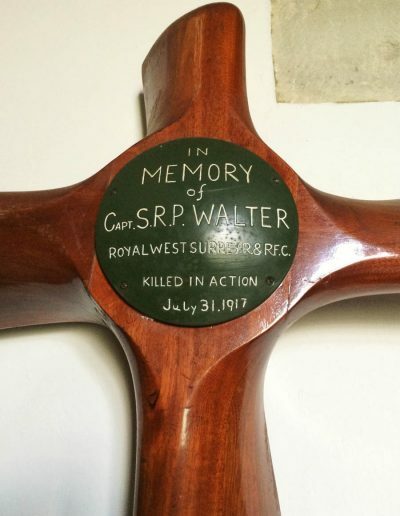 The SE5 could carry a four-bladed prop and, of course, spares or damaged examples would have been available at the workshops of Lt Walter’s squadron, assuming – as would seem likely – that that is where the marker was made. Unfortunately it was not possible to see any specific type markings on the propeller in question, in order to be sure. 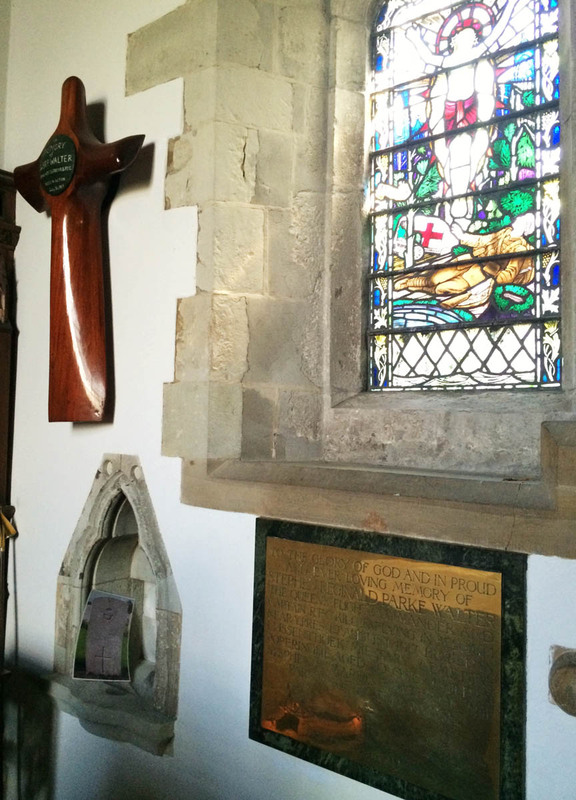 At the back of the church on the south wall is a wooden war memorial comprising engraved tablets. 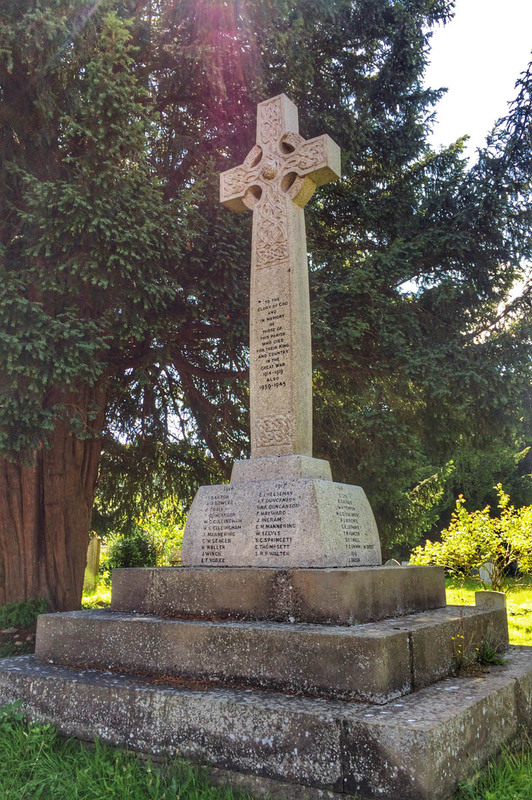 Lt Walter’s name is further recorded at bottom right on the front face of the Parish War Memorial, which takes the form of a large granite Celtic cross situated in the churchyard to the east of the church building. 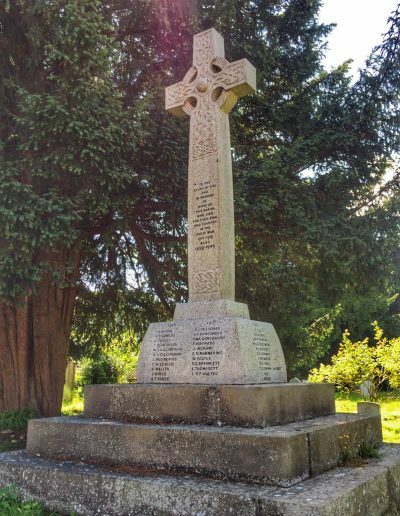 There are a scattering of First and Second World War CWGC grave stones dotted around the churchyard. A walk to the rear (north) of the churchyard is repaid with excellent views down into the Medway Valley. 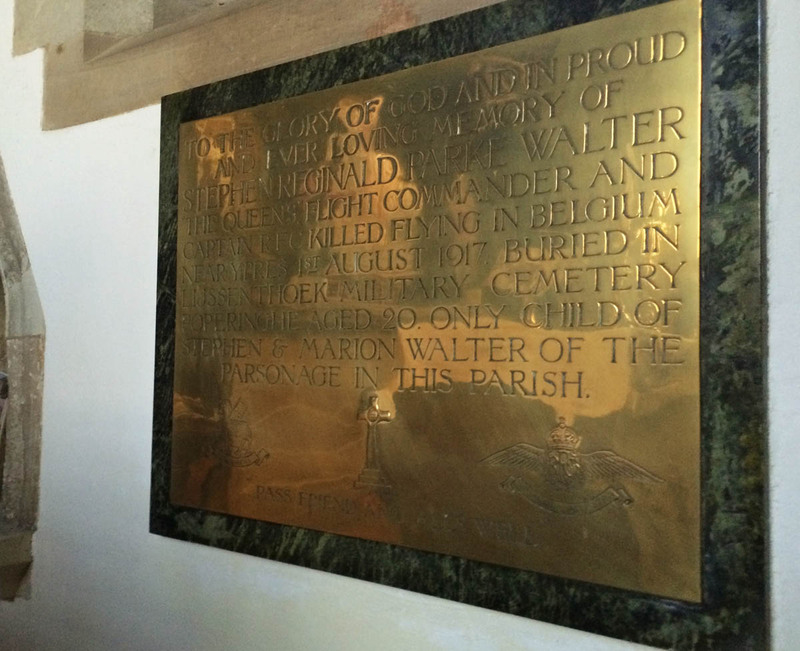 Some interesting anomalies – the marker and accompanying brass plaque both refer to Lt Walter as a Captain. 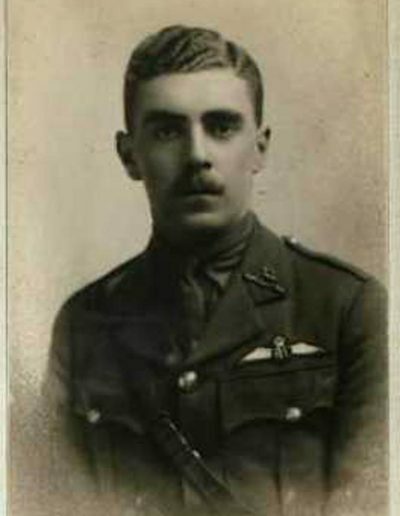 He is recorded as a Lieutenant by the CWGC. The brass plaque states his date of death as 1st August, whereas the propeller marker and CWGC headstone both record it as 31st July. Lt Walter’s father (understood to have had a military background and to have been a serving officer in the Queen’s Regt during the First World War) is listed as the Reverend Walter in CWGC records. 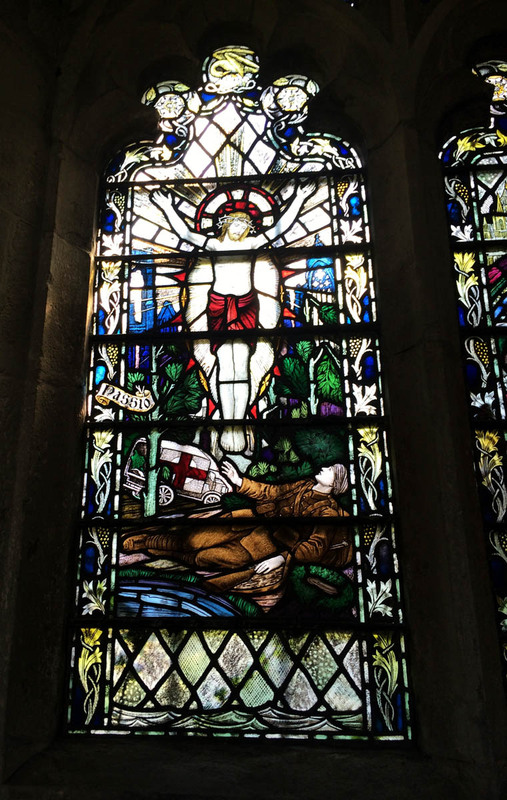 However, he is not it seems (despite living at the Parsonage), listed among the vicars of East Farleigh church. Would-be visitors, please note: the church is kept locked and ‘off the cuff’ visits and requests for entry are seemingly not encouraged.